This is an actual Executive summary for the same film at the Million Dollar Budget and the Development Budget. 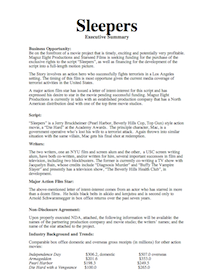 The Executive summary is the first thing an investor sees when he is interested in investing in your film. Your film is a business and you have to write an attractive business proposal if you are going to get money from the investors. A good Executive Summary for a film will have an attractive Business opportunity, script, writers, film star, industry background trends, Management team, consultants, use of funds, exit strategy and more.